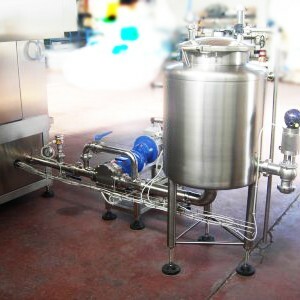 Electronic weight filling system based on mass flow meters. 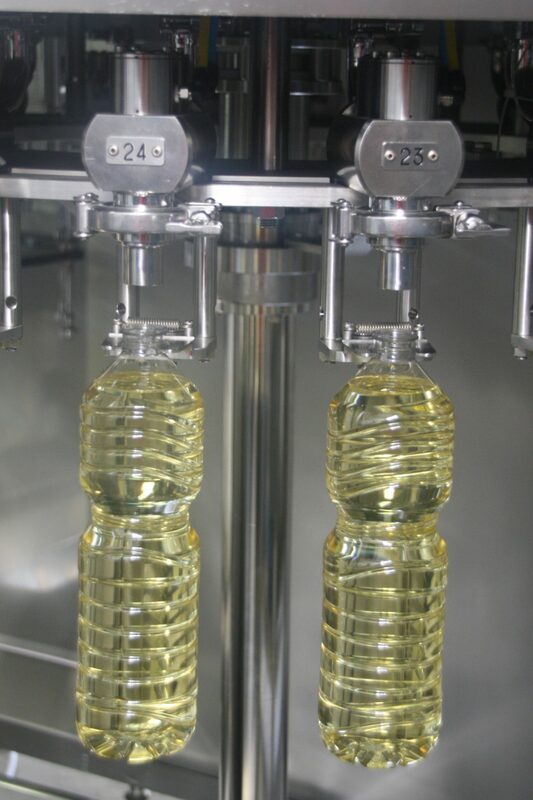 Filling without contact between bottle and filling valve. Filling valve opening by pneumatic electro valve driven by bottle presence sensor signal (opening) and mass flow meter signal (closure). Double filling speed, to guarantee reduced filling time and to avoid product splash out. Electric board for the flow meter signal management and electro valves for filling valve controls installed on the carousel to guarantee easy access. Weight set up for each filling valve in the operator touch screen panel. Memorization of parameters set for each bottle size, with the possibility to select them from the operator touch screen panel. External product feeding tank complete with level control, infeed valve, pump for product transfer to the filling valves. Product transfer from external feeding tank to the filling valves by pump driven by inverter to keep constant pressure. Lower manifold for the connection fixed pipe – rotating pipe with special treatment in the sliding parts to guarantee longer life. Product distribution from central pipe to filling valves with small distributor easy to clean. Upper manifold for compressed air and electric signals distribution with special treatment in the sliding parts to guarantee longer life. 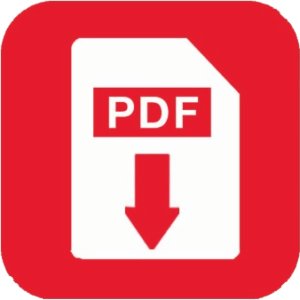 Parts in contact with the product in stainless steel AISI 304 (standard) or AISI 316 (on demand). Sealing rubber complying with food norms. Circumferential tray to collect the product at the end of the production. Carousel frame manufactured in stainless steel AISI 304. Bottle neck grippers fixed to the carrousel without bottle lifters, to keep the bottles centered under the filling valves. 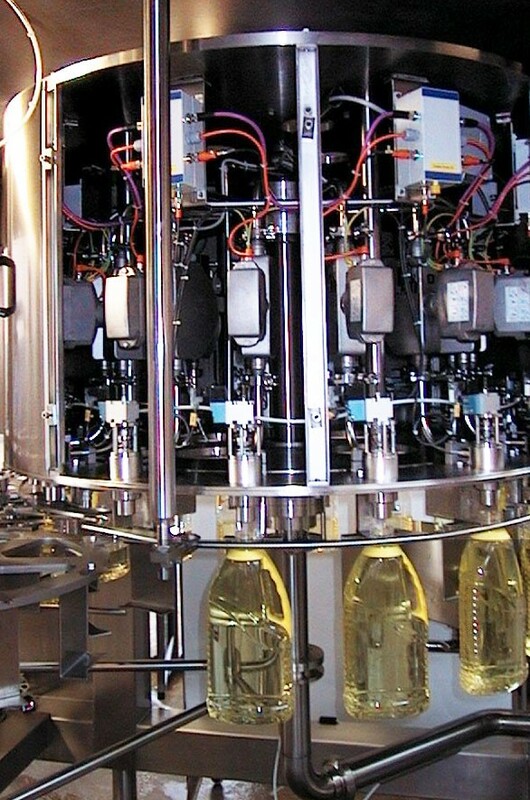 Machine available in “neck handling” version (fixed height carrousel and bottle support in the neck, typically used for PET bottles) or in “body handling” version (height adjustable carrousel and bottle support in the bottom, typically used for glass bottles or bottles with neck finish without ring). 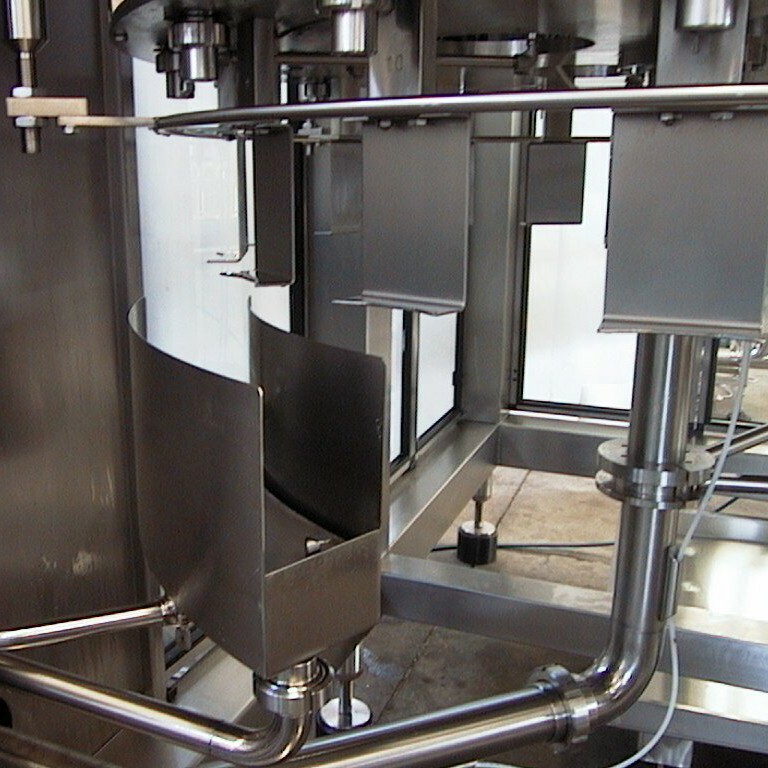 The system guarantees the weight inside the bottle by means a mass flowmeter. Flowmeter’s output is in pulses, that are processed by an electronic board in communication with the PLC and with the electrovalves that drives the opening of the filling valve. When the number of counted pulses equals the number of pulses set for the working size, the filling valve is closed. Not to have the measuring system in contact with the bottle (typical of the systems based on weighing cells). 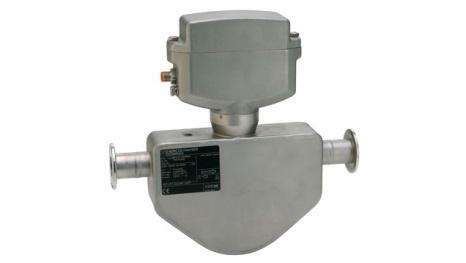 Mass flow meter weight fillers are frequently compared with load cell weight fillers. 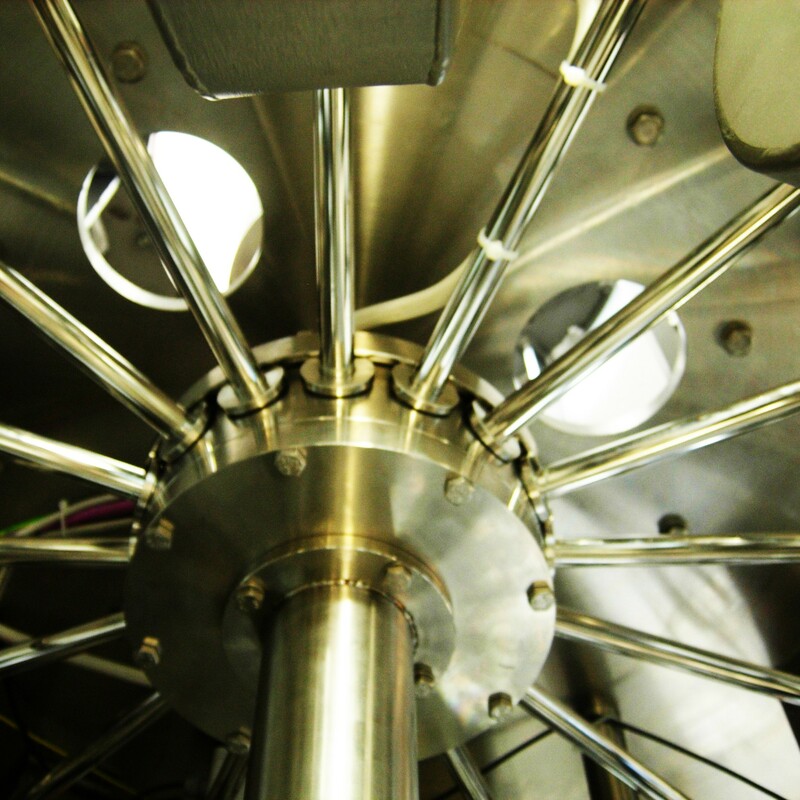 Both systems are weight filling systems, since they are based on instruments (mass flowmeter – load cell) having as output electric pulses corresponding to a weight, and both, compared with volumetric fillers, have the advantage not to be influenced by the temperature. The advantage of the mass flow meter is to be installed on the filling valve feeding pipe, therefore it is not in contact with the container. This means to avoid potential damages caused by shots received by the container during its movement, especially in high speed rotary fillers. 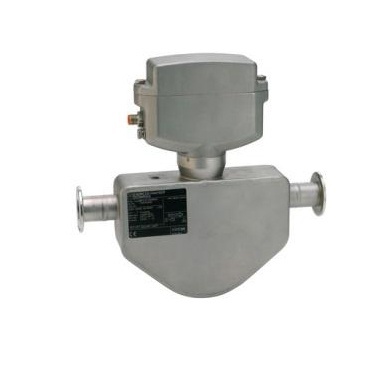 Moreover the mass flow meter is always over the container, whilst the load cell is typically under the container, which means high risk to be wetted by the filled product in case of bottle crash or not correct functioning of the filling valve. The machine is complete with a tray on an arc of the carrousel that allows emptying the machine at the end of the production or in case of product change, opening the valves in correspondence of this tray. To have an external tank simplifies the internal structure of the filler. The external tank can be easily inspected simply removing its cover. Pump speed is controlled with frequency converter using the signals coming from a pressure transducer positioned on the delivery pipe. This solution allows having constant pressure at the filling valves, which means higher filling accuracy. Small central manifold that guarantees cleaning easiness. 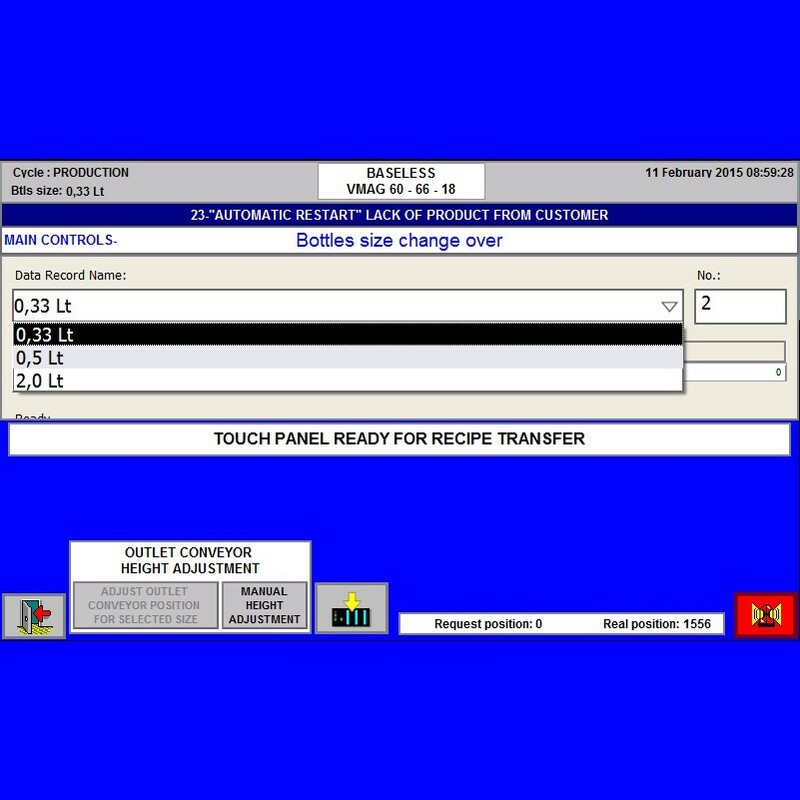 The parameters for each bottle size are memorized in recipes that can be quickly loaded from touch panel.